Sorry folks, it's been a quiet month for blogging. I can only blame the Open University, really, because I've been working hard on my course. Still, sometimes it's nice to forget that I have another essay due in less than two weeks and play with some paper. 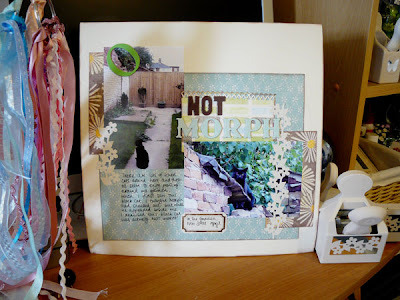 It's been a while since I put a scrapbook page on here so I thought I'd share this one. My cat Morpheus is, apparently, not the only black cat in the neighbourhood. I did a double-take when I saw this one sitting on my wall! And this is a little peek into my craft space too...the page is resting against my computer monitor. Yes, my Martha Stewart punches pretty much live on the desk, I use them so much. I would like to point out I do have another table that I actually craft on, this desk is only for my PC. Somehow the craftiness just gets everywhere though! And the crazy mess on the left is my ribbon collection, which lives on 2-inch book rings that are at the moment hanging from my desk lamp. It's not neat but it makes me smile.